Tell us why you set up Bayou Throws? Aron: After starting out making beads for ourselves to throw, we saw an opportunity to produce a reasonably priced, locally made bead that people would actually want to catch and wear. Nowadays, people duck out of the way when you throw the standard metallic beads. Misti: All our throws are made in the USA and are 100 percent recyclable. 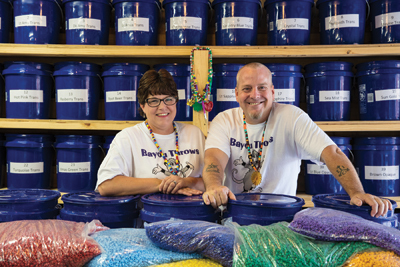 Our beads are made at a manufacturing plant in New Jersey, and we string them in the New Orleans metro area employing local people. Are the beads really recyclable? Misti: Yes, you can repurpose them or put them directly in a city recycling bin. Which krewes have your throws? Aron: The Krewe of King Arthur is our biggest customer with over 600 dozen in the parade last year. We also supplied several other krewes and we’re already working on ideas for 2018. Do you sell throws all year round? Aron: Yes, people also love throws for birthday parties, weddings, fundraisers and other events. Which throws are your favorites? Misti: Our Bryant’s Puzzle beads hold a special place for us. Our son is severely autistic so we made these in his honor. We donate a portion of the proceeds to local autism charities, including The Chartwell Center where he attends school and The Autism Society of Greater New Orleans. Do you have any new designs coming out that you are excited about? Aron: We’re working on offering custom logos and designs at reasonable prices.